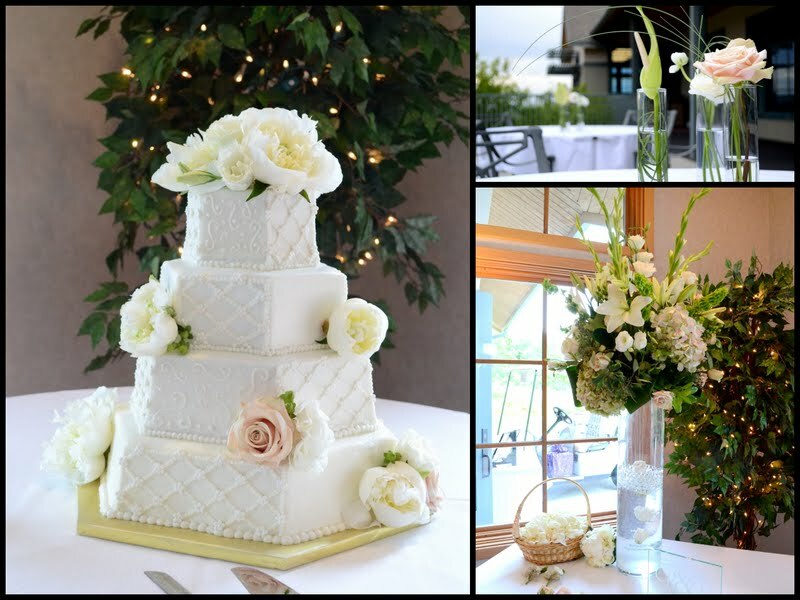 With a timeless soft white, fresh green and champagne color scheme this wedding was truly stunning. The rehearsal dinner was Friday night at the bride's home. We used a cluster of bud vases each filled with either an anthirium, rose, or rannuncula and accents of grass on half the tables and on the head table, while the other tables held a low, full and luscious arrangement with a mix of hydrangea, roses, bells of ireland, lisianthus, and green hypericum. 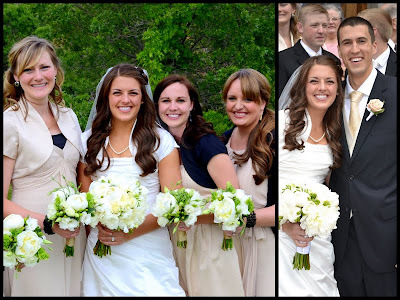 Isn't she a beautiful bride! I surely think so, but I am slightly biased, seeing as how we are related! Her bouquet was a fragrant mix of peonies, freesia, lisianthus, rannunculus, and roses wrapped in a white satin ribbon with pearl details. Her bridesmaids bouquets had a similar feel with a touch of green but adding bells of ireland, lisianthus and green hypericum berries. At her reception we used the clustered bud vases from the night before on the cocktail tables outside, decorated the cake with a mix of the blooms used throughout the wedding and had 2 spectacular arrangements with submerged roses on her sign in table and buffet table. 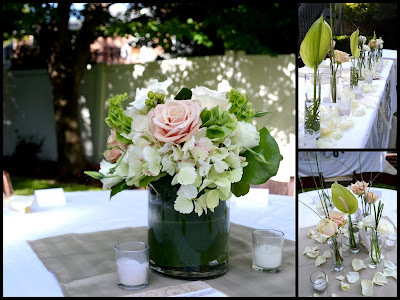 For her centerpieces we used a combination of the low arrangements from the night before and tall arrangements in glass cylinders filled with blooming white gladiolas. 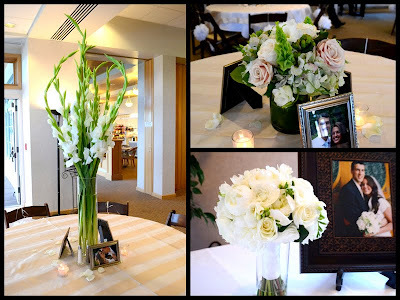 We also used rose petals and votive candles on all the tables to add that extra hint of romance. It was a beautiful 2 day celebration for an absolutely fabulous couple!